(3) Absorbance – the proportion of solar radiation absorbed by the glass. 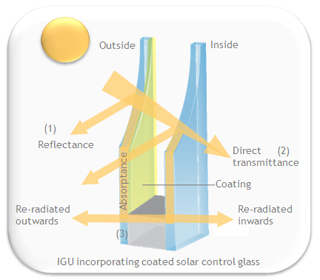 In hot conditions or for building with high internal loads, solar control glass is used to minimize solar heat gain. It allows sunlight to pass through a window while radiating and reflecting away a large amount of the sun's heat. Pilkington Solar-E™ Plus pyroltyic coating offers improved solar heat gain coefficient.